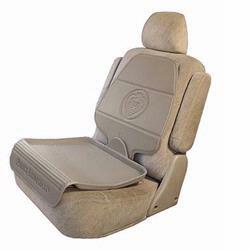 The Two-Stage Seatsaver Its high-density foam construction prevents depression damage that is caused by car seats. The bottom tray keeps all cars seats level and in proper position, and the kick plate protects upholstery from shoe scuffs. Works with all LATCH compatible car seat systems and fits all automobiles. Available in Black, Gray and Beige. Stage 1 - Bottom tray is used alone with rear facing infant seats. Stage 2 - Back attaches to the bottom tray for use with forward facing toddler and booster car seats.